Landfill gate fees typically cover costs of operation, overheads, mobile plant and equipment, labour, depreciation costs of roads and buildings and other fixed assets and profit. But the costs (and therefore the gate fee), also need to include 30-50 year post closure management, long term monitoring and reporting, and importantly replacement of the landfill asset itself. In MRA’s experience, many rural, local council run landfills do not recognise these latter costs and as a result gate fees are too low to cover the true costs of operation. Post closure management can be very expensive. MRA has seen costs from $1-20 million in post closure rehabilitation. The cost depends upon the scale of the landfill, location, risk profile and proximity to sensitive environments. Failure to account for these costs in the operating gate fee leaves an unfunded liability (see below). Similarly, the EPA’s of Australia require monitoring of the closed landfill for up to 50 years prior to relinquishment of the landfill licence. Costs can range from $10-$200k per year. Another significant oversight in landfill pricing, is failure to account for the consumption of void space and therefore landfill asset replacement. We think the main reason may be related to how the (local government) landfill, came into being. Privately owned landfills are generally “purchased” on the open market as quarries or existing landfills. A savvy seller will include a factor to account for the value of the void (air space to be used for future landfilling). This will be reflected in the price and therefore in the operating costs of the landfill. 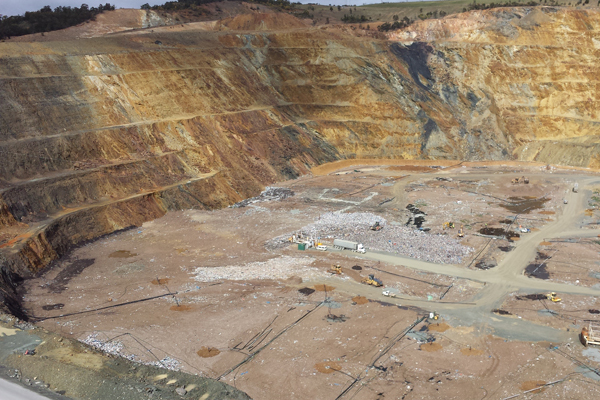 Many councils “inherit” their landfills from council quarry operations or previous generations. Consequently, the airspace is a (“free”) gift. These councils generally depreciate fixed assets on the landfill (roads and buildings, weighbridges etc), but since the void was free, few account for its replacement, once consumed. That is fine if all generations of users get the same benefits i.e. inheriting free voids. But as landfill void opportunities shrink and landfills become harder to find or approve and costs of replacement rise, future landfill users are at a significant cost disadvantage to current users. MRA estimates that these replacement costs can cost $16 – $50 per tonne depending on the size of the landfill. Contingent Liabilities (a possible obligation which arises from past events but will be confirmed only by uncertain future events; or is not probable or the amount cannot be reliably estimated) must be disclosed but not accounted for (until it becomes probable). Most landfill related liabilities are of relatively known timing and for which a reliable estimate can be made. Therefore, they should be recognised in the accounts as a Provision (or at the very least a Contingent Liability). Most are not. Many Councils intend to borrow to fund the next landfill (and therefore they don’t need to provide for asset replacement from current users). That is fine. Future users will be paying off the landfill via the debt service costs built into the gate fee. But what about current users of the current landfill? How are current users contributing or being charged, particularly if the landfill was “inherited”? Few existing, council owned, landfills are debt funded. Unfunded liabilities have to be met by someone. Whether it is post-closure rehabilitation, 50 year monitoring or asset replacement, someone has to pay. And the costs can be high. For example Esperance Council in WA has recently introduced a one-off $6 million ratepayer fee because it underpriced its landfill gate fee over the operating life. General ratepayers have ended up subsidising all landfill users. According to The West Australian, the costs could have been as high as $15m. A Victorian council was forced to pay $23.5 million in compensation to 771 residents after they were forced to evacuate homes due to dangerously high levels of methane gas. The majority of the costs will paid by the Council (with the Victorian EPA contributing $10 million; The Age). The cost to remediate Lake Macquarie City Council’s quarries, landfills and sanitary depots has skyrocketed from $16 million to $36 million over a few years. (In 2006, the council estimated the remediation costs at $11.3million; Newcastle Herald). In 2013-14, TPI (Cleanaway) allocated an additional $154 million to post closure remediation, monitoring and reporting across its seven operational landfills and six closed landfills. In total, TPI’s total landfill related provisions now amount to $347 million (Ben Global). Most Councils introduce special rates to meet unfunded landfill liabilities. But ratepayers are not necessarily the same group as landfill users. On average 50-60% of all landfill waste is non-domestic (commercial and construction) waste but the majority of ratepayers are households. So it is not fair for households to subsidise both big commercial generators like clubs and pubs, retailers and building companies, as well as all past users. Elected representatives understandably want to keep landfill gate fees low for their ratepayers. That is fair enough. But rather than asking “How will our ratepayers afford this?” they should be asking “What is the real cost of this service and who is going to pay for it – ratepayers or landfill users?” They are most often not the same or have very different waste generation profiles. Once the landfill has been filled, there is no chance to go back and recover the losses – and someone has to pay. Underpricing landfills is both economically and environmentally detrimental. It can often lead to significant unfunded liabilities and costs to ratepayers. It can bias the market and introduce anti-competitive forces. Importantly, artificially cheap landfill undermines all other recycling and resource recovery opportunities. Low recycling rates means fewer jobs are being created in this sector. For every job we create in landfill we create 3.3 in recycling. Councillors in rural areas across Australia often ask MRA to work on regional jobs growth opportunities related to waste and resources. The first thing we look at is the landfill gate fee to see whether local recycling is viable or not. Higher landfill prices create the headroom for recyclers to operate competitively. 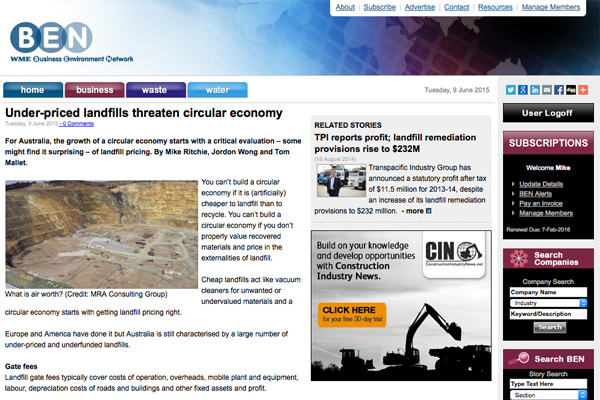 The higher landfill costs in Sydney have seen a renaissance in recycling and resource recovery business activity. Combined with the NSW EPA Waste Less Recycle More grants (funded via landfill levies) hundreds of new jobs are being created every year. And importantly recycling jobs are green collar jobs and largely recession proof. They are countercyclical to mining booms and busts. 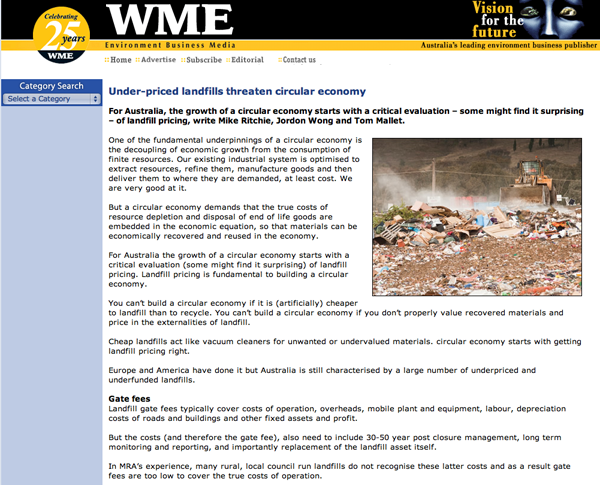 Recycling is probably the fastest growing manufacturing sector in Australia. It is in a growth cycle due to rising environmental controls on landfills and the introduction of landfill pricing signals. Did you buy or “inherit” the landfill? Does the gate fee cover all operating (fixed and variable) costs and profit? post closure maintenance and reporting? large landfills (>100,000 tpa) approximately ≥ $50/t. Of course there are variants on this theme but pricing outside these general parameters should be reviewed to ensure unfunded liabilities do not arise. The key learning from the BDA study is that small landfills are particularly vulnerable to unfunded liabilities. 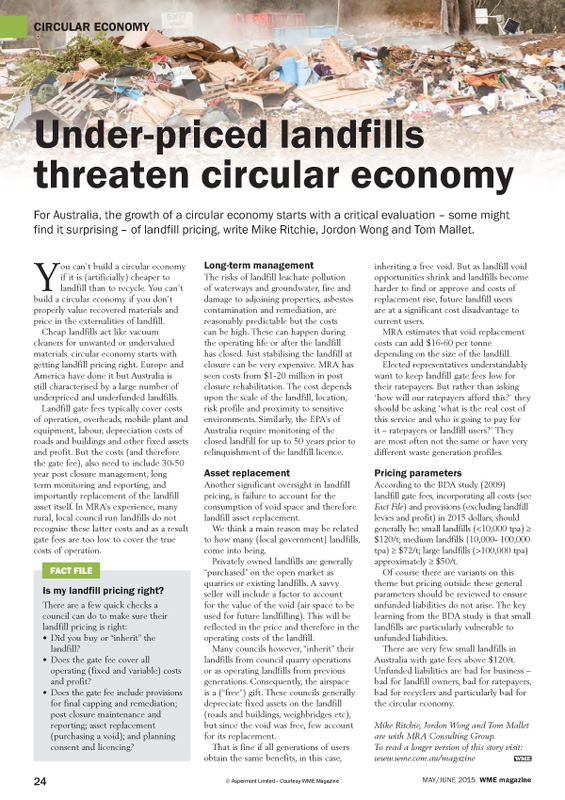 There are very few small landfills in Australia with landfill gate fees above $120/t. MRA works with a large number of landfill owners to quantify liabilities and operating costs, as well as strategies to engage the community on the need to realistically price landfill services. Unfunded liabilities are bad for business. Bad for landfill owners, bad for councils, bad for ratepayers and bad for recyclers. If you manage a landfill in NSW, there is no time like now to review the financial operation of your landfill. The NSW government is funding landfill consolidation and environmental improvements grants. Read more about the grants here. 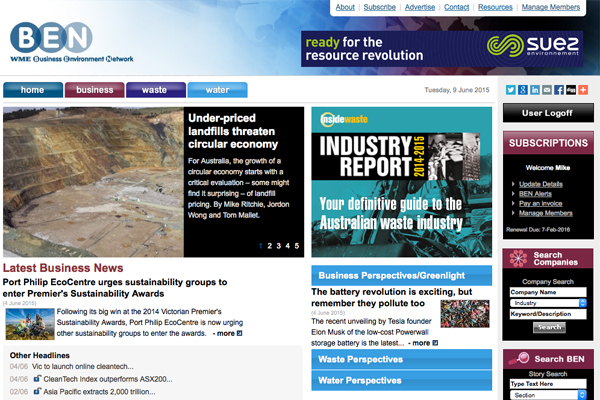 ← Processing or storing waste in NSW? Don’t get caught short – August 1st deadline!